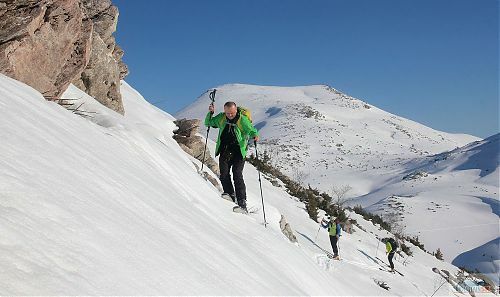 In Macedonia one can find countless beautiful mountains suitable for skialpinism of all categories. 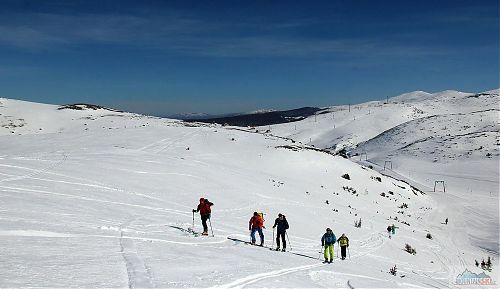 Among others, Mavrovo is a great starting point, or the biggest Macedonian ski resort Zare Lazarevski. 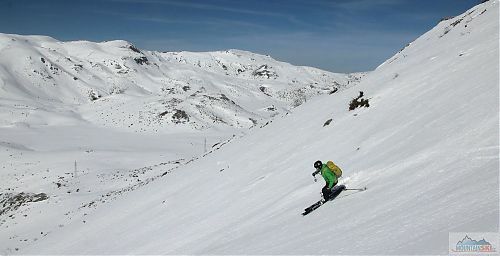 Many peaks, starting from 1900 m, are accessible from a plateau in the upper part of this skiing resort. The major part of this trip is identical with the way to Šar Planina mountains. Starting in Brno, drive through Hungary towards Belgrade. After leaving Serbia miss Skopje, the capital of Macedonia, but continue with road E65 to Tetovo. From Tetovo goes a typical Macedonian highway all the way to Gostivar. Later a slow ascent to the mountains follows. From the main road to Ohrid turn to a mountain road towards Debar. By crossing the mountain ridge a wonderful view to Mavrovo lake is revealed (approx. 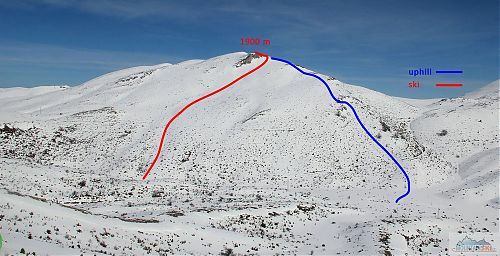 1200 m). 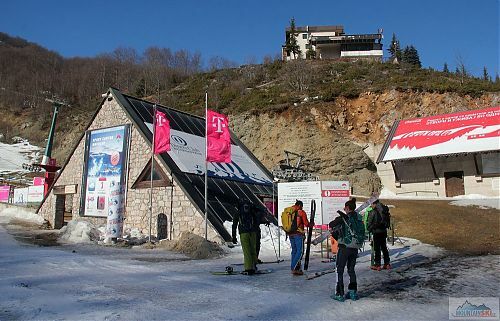 Moreover, on the southern bank you can already spot the main ski slopes of Zare Lazarevski ski resort and estimate so the current snow conditions. 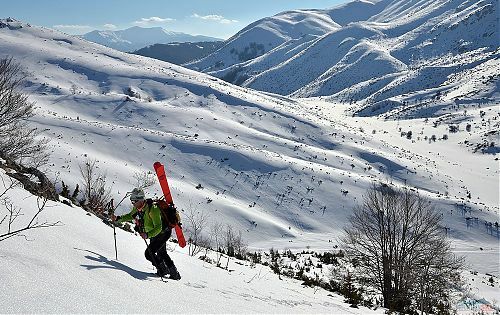 Uphill from Mavrovo, skis or ropeway? Sure, true skialpinists wouldn’t even ask this question and go directly with the skins on. However, sparing good 400 altitude meters for just 3 EUR might for someone sound tempting. We chose the ropeway. It took us to the altitude of approx. 1650 m, from where we took the last east-west ski lift. After putting the skins on, there was a flatland going right to two parallel ski lifts heading south-west. At the lower station of the longer one we went off the conditioned slope and started ascending to a mountain ridge. We reached the ridge in altitude of less than 1900 m and then continued along the ridge right up to the flat top. Its flatness might appear a little boring, but it allows a magnificent view of all NP Mavrovo and even farther mountains. 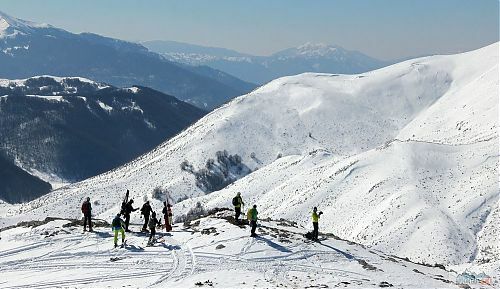 Among them a dominant massif of Golem Korab (2764 m) stands out, the highest Macedonian peak. From the top there are several possible downhills. The basic one goes around a top rock and then down the hillside right into the valley. After the first few turns to assess the snow quality we let ourselves go and enjoyed a neat ride. We finished the downhill near a summer road (1560 m) leading from Mavrovo lake to Galičnik village. 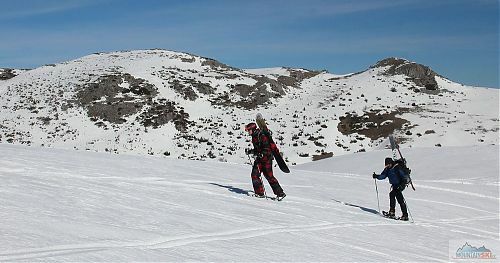 The road was under deep snow, so we just put the skins on and started seeking a proper ascent route. Eventually we picked the steeper one, partially on rock. The rocks turned to be quite fun in the end. We reached the top again and waited for the setting sun to cover all surrounding mountains with its golden light. A downhill to Mavrovo was ahead of us. A lovely long ride over the hillside right to the lower ski lift stations. After ascending few tens of meters back to the top station of the ropeway from Mavrovo, we finished with our last downhill. 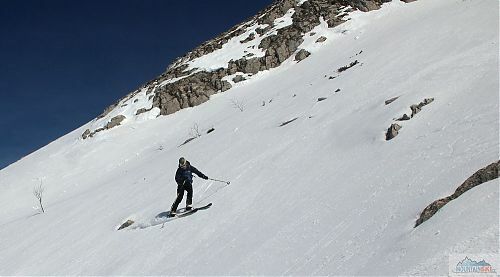 Since there was an insufficient snow cover at the free hillside, we were forced to ski down strictly by the ski slope.